I cannot say how long this road shall be. But fear not the obstacles in your path, for Fate has vouchsafed your reward. And though the road may wind, and yea, your hearts grow weary, still shall ye foller the way, even unto your salvation. Michigan's non-conference schedule is tough but manageable. But even a best case scenario would see potentially one loss here. The opener at Utah, much like matchups with the Irish in years gone by, will go a long way in determining just what kind of a year Michigan is going to have. In this particular dramatization, Utah is a loss. The home opener against Oregon State and their new head coach Gary Andersen whom you may know from Wisconsin will also be a good test for this team. So much so that even this too will be a loss. O and two and whatcha gonna do? Well, beat UNLV and BYU of course. Michigan rights the ship just in time to pull to .500 and save a little face before Big Ten play. The B1G opener @ Maryland in primetime is a brutal reminder of the struggles faced against Utah in early September (and every away opponent since Rich Rod). Ruddock and Morris split time with neither really gaining any momentum. Michigan's defense keeps it close, but loses in typical fashion. Harbaugh and company rebound nicely a week later in the Big House for a homecoming win against Northwestern to pull back to even at 3-3 setting up a tough matchup against a 6-0 Spartan squad the following week. Michigan State finds out quickly that this is not like previous Michigan teams. The Wolverines battle valiantly going punch for punch. But alas, the experience of Dantonio and his stout defense proves too much as Michigan State escapes Ann Arbor with a 3-point overtime victory. Reeling, Michigan regroups a week later in Minneapolis to edge out Minnesota in primetime for a statement win against the B1G West's better squads. Rutgers at home and Indiana on the road are also wins which helps get Michigan back above .500 for the first time all year. With a bowl secured and two major tests left, Michigan travels to Happy Valley for a showdown with the resurgent Nittany Lions who've surprised some folks this year. As the cold rain pours down, Michigan struggles to get anything going offensively and Penn State wins a low scoring affair. At 6-5 with the #1 ranked and undefeated Buckeye's coming to town, Michigan and Harbaugh know this is their chance to make a huge statement. But they don't. Ohio State wins by 3 touchdowns. Michigan then heads to the WhoCares.com Bowl to face the mighty whoevers from Some Random College in which no one knows who won because the game wasn't even televised or live tweeted because no one could find the stadium. Well, we know our rivals would have a field day. It should be said right off the bat that should this worst case scenario come to fruition, there will not be a soapbox large enough to hold the amount of people ready and willing to point and laugh at Michigan and their quote unquote savior. All those quirky tweets are fun right now, but hang 6-7 losses on the board and all of the sudden it's like the clock has struck midnight or something. No one would lose their jobs or anything of course...but the off-season would be rife with finger pointing and questions about everything. If this Michigan teams hangs this many losses on the board with this coaching staff, it's possible things were more broken than we originally thought. In which case Harbaugh's rebuilding effort might take 1 or 2 years. Think 2012 Ohio State. Maybe not that great of a bounce, but darn close. I really do think we lose to Utah, hate to say it. Michigan will be tested by the Utes who will love nothing more than to rain on Michigan's Harbaugh parade. It's a close loss, but Michigan rebounds nicely a week later against Oregon State to give Jim his first Michigan win. UNLV is a blowout and BYU tests Michigan but can't hang. Now, here's where I get a little nutty. See, us Michigan fans have been conditioned to just expect to lose any and all away games against even moderately skilled opponents. Maryland, which I feel is primed for a sophomore B1G slump is one of those moderately skilled opponents. So with that said, Maryland is a win. So is Northwestern. So...it's the showdown the college football Gods have been waiting for. Harbaugh vs. Dantonio. Both teams ranked and meeting on the sport's largest stage. Quite simply, it's the biggest matchup between Michigan and Michigan State in years. Michigan takes advantage of the friendly home field and narrowly beats Sparty in a double overtime thriller. Michigan State has the experience and the talent, and Michigan was a 7-point underdog, but the Wolverines played well above their pay grade while Sparty definitely let this one slip away. The game goes down in Michigan lore right next to Braylonfest. Even in this best case, dream world scenario, there are will some hiccups. Minnesota proves to be just the right opponent at just the right time, catching Michigan right after a huge win in a classic trap game. The Gophers keep the Little Brown Jug en route to the Big Ten West crown. Rutgers and Indiana are wins. Penn State begins the year with promise but key injuries hobble the Nittany Lions, and by the end of November there's not much fight left. Michigan goes into Penn State's erector set of a stadium and drives another nail into their 2015 coffin. And with that, Michigan and Ohio State...at last the showdown the world's been waiting for. Tickets are fetching $2000 a piece on Stubhub. The entire country is shut down to watch the 11-0 Buckeyes enter the Big House to take on the 9-2 Wolverines. Ohio State hasn't won by less than 3 touchdowns all season. Much like 1969, 2-loss Michigan with a first-year coach is ready to play spoiler on undefeated Ohio State's national title hunt with arguably Urban's best team yet. The game is a defensive battle. Billed at the game of the year, it quickly lives up to the hype. Michigan and Ohio State trade touchdowns back and forth for the first half...going into the break tied at 14. Michigan breaks the game wide open as Jabrill Peppers brings the second half kick back for a touchdown (shades of Desmond and Woodson). When its all said and done, Michigan's 10 second half points are just enough as they send the Buckeyes back to Columbus with a 24-20 loss. Michigan gets an invite to a major bowl in which they win of course...finishing off the year 11-2 and ranked in the top 10. So the best case scenario, while great and all, probably ain't gonna happen. I mean if it does, awesome, but no one should be expecting that. There is a large subset of the fan base that thinks Harbaugh might never lose...to which all I can say is good luck with that. The Big Ten gets a bad wrap but that's all about to change. The days of marching through the league unscathed are soon to be over. You could argue the Big Ten is entering a so-called golden age for football. For Michigan's 2015 campaign, one has to temper those lofty expectations a bit. Yes, Jim Harbaugh is a maniacal football guru, but you can't expect perfection right out of the box. Three or four losses would not surprise me. Michigan is still a team that needs to re-learn how to win. That road is often a little bumpy, despite any skill or coaching advantages. 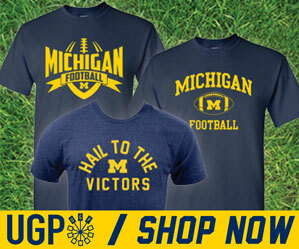 I think Michigan gets a win against either Michigan State or Ohio State. I think they lose to Utah because its the opener and I haven't seen anything to make me feel all warm and fuzzy about a primetime road game in the mountain time zone. I think there's probably a road loss at either Maryland, Minnesota or Penn State. And I think Oregon State and BYU are going to be a tougher challenge than expected. Football is a funny game and momentum can swing in a heartbeat. Injuries and flukes can make or break your season. To be close to that best case scenario, Michigan needs to get a little lucky...something that hasn't happened much these last 7 years.